This post is sponsored by Edens Garden and may contain affiliate links. Although I am an esthetician who fawns over medically advanced skincare technology, I have to agree that all those synthetic chemicals and harsh ingredients can often hurt your skin more than help it down the line. Essential oils have proven time and time again to be the most effective in providing results without all of the side effects. Although essential oils have the word “oil” in it, essential oils are not comedogenic, so they won’t clog your pores. In fact, some oils help to reduce oiliness and the appearance of enlarged pores! I have dabbled with oils for years and hopped from brand to brand, even using the biggest brands like Young Living and DoTerra. While I can’t argue that both brands offer the highest quality of oils on the market, their price mark-ups make essential oils a costly addition to one’s lifestyle. 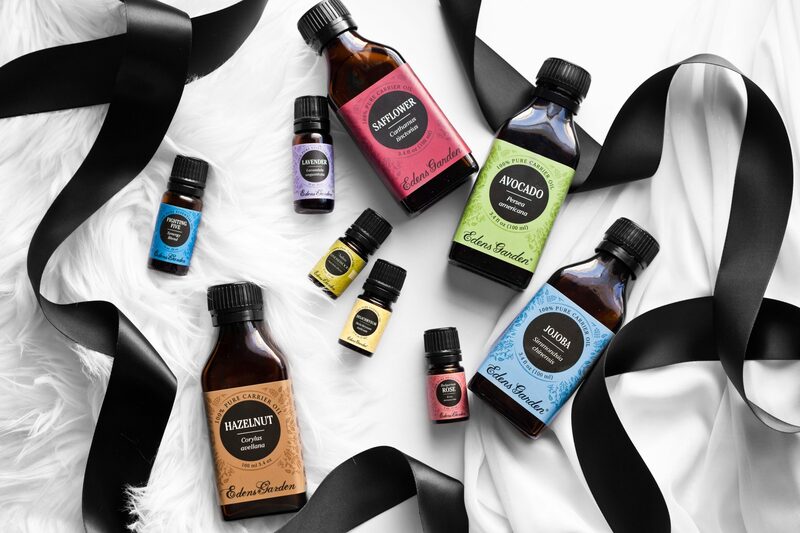 Fortunately, my favorite essential oil company Edens Garden provides oils of equal quality to the biggest EO brands out there, for just a fraction of the price. Since Edens Garden has no independent distributor program, they are able to cut out the middleman and keep their prices as low as possible. Lavender: Soothes redness, inflammation and stressed skin, perfect after blackhead and pimple extractions. Also a soothing oil to reduce and relieve stress. Tea Tree: Antiseptic and antifungal that battles acne-causing bacteria. Tea Tree can be used to disinfect cuts and even household surfaces when diluted with water or apple cider vinegar. Lemon: Lightens up dark spots and hyperpigmentation caused by acne. Also a natural disinfectant and antifungal that can clean household surfaces. Frankincense Sacra: Helps restore an even skin tone and smooth out fine lines. Frankincense can be diffused or applied topically to reduce anxiety and stress and also contains anti-inflammatory properties, perfect for people dealing with chronic pains. Geranium: Great for regulating sebum production. Geranium also helps to balance hormones, so during your monthly cycle you can dilute this with a carrier oil and apply to your lower abdomen to help reduce cramps. Peppermint: Highly effective in reducing the size of cystic acne and also a powerful migraine reliever. Applying on the temples and scalp will banish headaches within minutes. You can also dilute Peppermint oil with a carrier oil and massage it into problem areas like joints and achy muscles for pain relief. You can save even more money by mixing and matching various oils into a “Create Your Own” set. You can get a 6-pack set of oils for just $31.95. On the highly-coveted end of the spectrum, there are even more powerful essential oils that can yield enormous skincare results nearly overnight. These oils may be pricier due to the tedious methods of extraction but are definitely worth investing in later along the line. Keep in mind that Edens Garden oils are more affordable than other quality essential oil companies, so you can’t get high-quality oils at these prices anywhere else. Bulgarian Rose: On top of its soothing, anti-aging and anti-inflammatory properties for skin, Rose is one of the most powerful natural antidepressants, which makes it effective to use in an oil diffuser (My favorite diffuser is Eden’s Garden’s Ceramic Ultrasonic diffuser). Rose also helps with a variety of physical ailments from arthritis to indigestion and even helps treat wounds quickly. East Indian Sandalwood: Sandalwood of the East Indian variety is almost extinct and therefore pricier than most oils due to its powerful medicinal effects. Aside from its ability to treat skin problems from acne to wounds, Sandalwood can be used for a variety of purposes from boosting memory, sedating anxiety, lowering blood pressure and much more. Helichrysum Italicum: Of all highly-coveted oils, Helichrysum Italicum is the most effective at healing cuts and wounds quickly and without scarring. This oil can even treat spasms and even slow down hemorrhaging. Jasmine: This oil has properties similar to Rose, but with a much more intoxicating and sensual aroma. On top of its anti-depressant and expectorant properties, Jasmine is highly effective for reversing the signs of aging as well as scars and stretch marks. Combining essential oils with a proper skincare regimen can easily help you achieve a glowing complexion while balancing out your moisture levels and sebum production. Not sure where to start? Here are 5 of my favorite DIY essential oil recipes that address different skin concerns. Tea Tree has powerful antiseptic properties that battle acne-inducing bacteria, while Geranium helps to regulate sebum production, making it great for oily skin. However, be sure to dilute Geranium with a carrier oil like Hazelnut or Safflower oil, as Geranium may be a potential allergen to some people with sensitive skin. Both carrier oils are high in linoleic acid, which benefits oily skin types as linoleic acid levels tend to be much lower for this skin type. 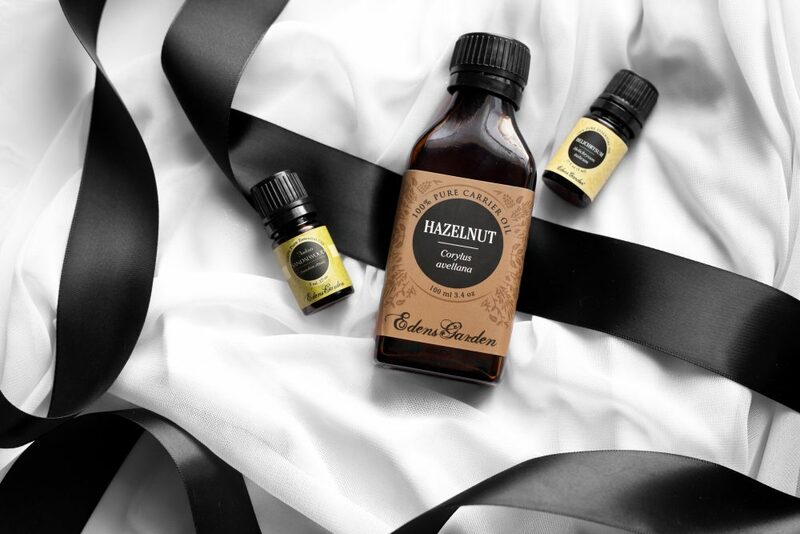 Hazelnut oil is non-greasy and absorbs into the skin very quickly, making it ideal for oily skin types. If you tend to break out more often, then try Safflower oil as its perfect for both acne-prone skin and clogged pores. A great moisturizing and healing oil perfect for oily skin is East Indian Sandalwood. A single drop can spread across the entire face due to its thickness, although it absorbs well and helps fend off potential breakouts without overdrying the skin, providing a good balance of radiance and moisture. To use: dilute a drop of Tea Tree and Geranium in a dime-sized amount of Hazelnut or Safflower oil and spread a thin layer across the face. Sandalwood can be diluted, although since it is viscous I like to dab some on sections of my face and spread evenly. Lemon oil has a strong whitening effect on skin, making it perfect for hyperpigmentation and acne scars. Helichrysum Italicum is known for healing all types of skin injuries from sunburn to open wounds and can diminish scars very quickly. Frankincense is perfect to achieve a smooth texture as well as an even skin tone; combine with East Indian Sandalwood and you’ll have a noticeably even complexion overnight (seriously, this is not an exaggeration!). Alternatively, you can mix Lemon with Age Defy, which is a blend of oils that work together to reduce fine lines, wrinkles and spots. Some people prefer to get Age Defy rather than several oils as it’s a blend designed specifically for skincare purposes and is much more cost-effective. For a carrier oil, you can pick between lightweight Safflower Oil if you’re acne-prone or Avocado Oil if your skin is sensitive, dry or even if you want a boosted brightening effect. To use: Dilute a drop of each oil into a dime-sized amount of Safflower Oil or Avocado Oil and apply a thin layer across the face. Alternatively, use one drop of each oil without carrier oils as a spot treatment. Every zit has these common traits: redness, inflammation, swelling, and bacteria. Helichrysum Italicum accelerates healing and promotes healthy skin cell regeneration while tea tree helps to disinfect. Peppermint, and Lavender and Turmeric serve to reduce inflammation and redness. If you’re dealing with a wild breakout that appears in clusters, you may be able to reduce the local infection with a drop of Fighting Five, which is a powerful combination of germ-fighting oils. Make sure to dilute this oil with Safflower Oil or Neem Oil, as Fighting Five contains very spicy and “hot” oils that may burn your skin if used undiluted. To use: Apply one drop per essential oil and apply on trouble spots on the face or dilute a few drops with Safflower Oil or Neem Oil and spread thinly across the face. Lavender, Turmeric and Peppermint can be used as a spot treatment on swollen, angry and cystic acne to reduce inflammation. Dry, sensitive, irritated and even aging skin all share one thing in common: these skin types are not receiving enough nourishment and moisture to protect itself from external conditions like sun exposure and dry air. Jasmine is perfect for rejuvenating sensitive and dehydrated skin as well as treating other skin conditions such as eczema and even dermatitis. Bulgarian Rose is a luxurious oil that hydrates even the most parched and sensitive of skin, while East Indian Sandalwood brightens, smoothes and evens out skin tone. Instead of these 3 oils combined, you can also use Age Defy, which contains an alternative blend of anti-aging oils. 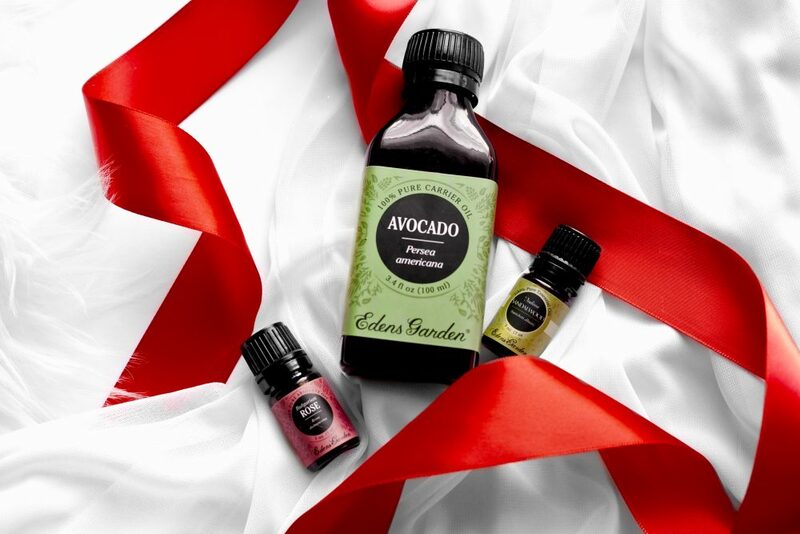 Mixing these essential oils with Avocado Oil ensures a much-needed dose of moisture. Aging skin? Evening Primrose Oil is a much better alternative to bring back elasticity and reduce wrinkles. If you’re looking to brighten and smooth your skin, then try Camellia Seed Oil. To use: Dilute a few drops with your carrier oil of choice and spread thinly across the face. Edens Gardens’s Cellulite Blend contains a detoxifying, brightening and tightening blend of oils that is perfect for not just cellulite but stretch marks as well. I swear by this blend as it’s reduced the depth and darkness of my stretch marks as well as reduced the dimples of the cellulite at the back of my thighs. I love mixing this with vitamin-rich Jojoba Oil, as it has a molecular structure very similar to our skin’s sebum, making it much easier to absorb. During the drier winter months, I replace Jojoba Oil with a shea butter as a nighttime treatment and wake up with hydrated and bright skin. Additionally, you can also use a 0.5mm derma roller to stimulate collagen production in the affected areas and immediately follow up with Cellulite and Jojoba Oil. This allows your skin to absorb much more of the healing properties of these oils. You will see a huge difference when incorporating a monthly derma roller treatment into your cellulite and stretch mark regimen. 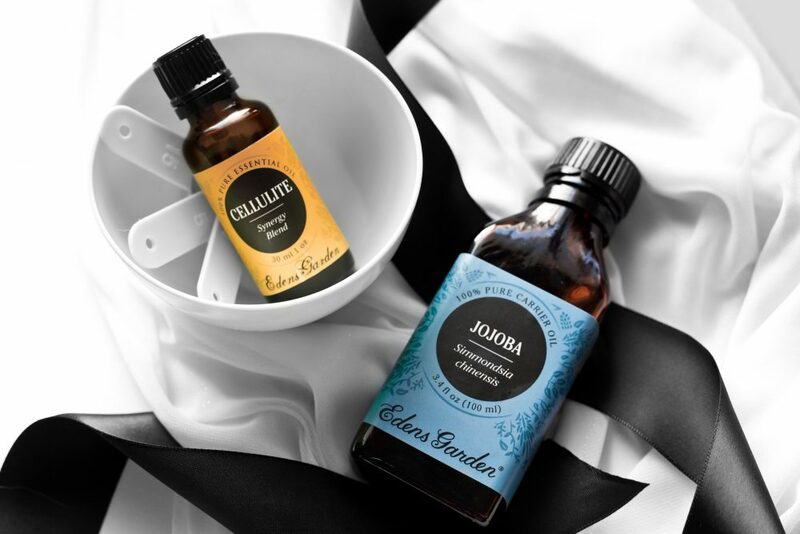 To use: Mix 5-10 drops of Cellulite with a palm full of Jojoba Oil and massage into affected areas. Let absorb before putting on clothes. I’ve been using essential oils in my skincare regimen for almost a decade now and can say that Edens Garden has been my favorite essential oil brand for years due to their huge library of oils, affordable prices and tremendous quality. If you haven’t tried incorporating essential oils into your skincare regimen, you should pick up some oils from Edens Garden and see the difference! Want more essential oil recipes and beauty tips? Subscribe to my newsletter below to get the latest blog posts delivered to your email. Lots of good information! Thank you. I really need to jump on the essential oils train. I’ve only used a few here and there for things, but the benefits and uses are so cray, I gotta try! I love using essential oils for my skin, especially frankincense! My 40+ year old complexion needs it to help tone and brighten. I am going to check this brand out that you recommend though. Such great information about all of those essential oils. I didn’t know about all of these. The one I am most curious about is the Hazelnut. I love the scent of that. Wonder how I could use it in various ways.